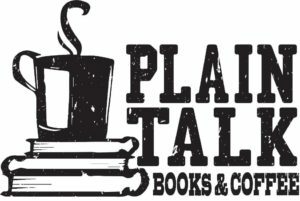 Plain Talk Books & Coffee, established in 2009 as Optimae’s first microbusiness, is a neighborhood bookstore, coffee shop, breakfast and lunch cafe located in the East Village. We have developed an extensive breakfast and lunch menu, including pastries from our pals at Brick Street Bakery. Our one-of-a-kind sandwiches and homemade soups have earned city-wide renown. We offer a full coffee shop drink menu, and brew our very own Railroad Bill's L&N Roast (roasted fresh each week by our friends at Raccoon Forks Foods in Ames) and organic, fair-trade coffee from Just Coffee Co-op in Madison, Wis.
We feature a diverse and sophisticated selection of new and used books, with hidden treasures and classics lining the shelves in a welcoming and charming environment. 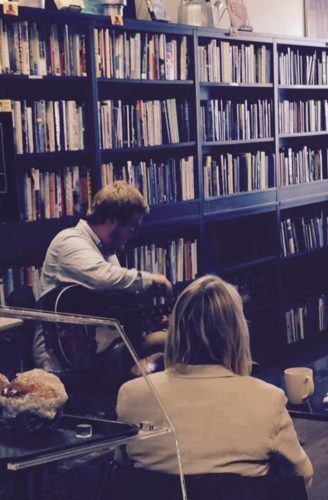 And as ardent supporters of the local arts (we regularly host live music and other events), we sell records by local musicians and art made by local artists. In the near future, we plan to expand into the former Hammer Pharmacy space next door. The expansion will include more seating, retail and event space, and additional menu options. Stay tuned for more details. As a Raccoon Forks microbusiness, Plain Talk provides job opportunities to individuals with disabilities and other barriers to employment. Employees at Plain Talk receive one-on-one job coaching and the support they need to build skills and be successful on the job.